Houdini is a man in the box for Science Channel's 'Last Secrets' – AiPT! More than being known as the greatest escape artist of all time, Harry Houdini was a man of many other secrets. One of the most interesting ideas is that he served Scotland Yard as a spy. Using his fame, during a a trip to Russia, he was able to gather information for England and the United States. Another mystery regarding Houdini’s time in Russia involves one of his most famous illusions: The Siberian Transport Escape. The third episode of Science Channel’s Houdini’s Last Secrets attempts to determine whether it would have been possible for Houdini to accomplish this feat. Known as a carette, a Siberian transport cell is essentially an enclosure police were able to use horses to draw. It was not more than seven feet in height and could fit no more than two to three prisoners. It was the perfect mode of transport for moving criminals from one prison to another. Houdini visited Russia in 1903, and one his most famous accounts was how he escaped from a carette in 28 minutes. (There are conflicting reports stating it was done in less time while others say it was more time. A lithograph done by Houdini states 28 minutes, and that is the time the team of Houdini’s Last Secrets adheres to for their test.) What makes the trick especially hard is that it’s actually a double escape, involving getting out of handcuffs and then escaping the carette itself. Houdini’s Last Secrets continues to follow the scientific nature of the first two episodes. Questions are asked and hypotheses are tested when trying to create the perfect replica of the carette Houdini escaped in 1903. To this end, Houdini’s great nephew, George Hardeen, travels the globe and questions Houdini collectors, authors, and experts as to how the trick may have been done. This information is relayed back to Steve Wolf, who creates the Siberian cell. Wolf does a great job of attempting to recreate Houdini’s stunt. Not only does he use the information collected by Hardeen, he uses modern pictures of carettes and Houdini’s lithograph to get as close an approximation of what Houdini reportedly escaped from as possible. It’s also interesting to see him building and testing the tools that the King of Cuffs may have used. Ironically, episode 3 lends itself to more scrutiny and cynicism than previous episodes, but it has nothing do with with Houdini himself and more to do with the team. Through research and investigation, they come to the conclusion that Houdini made detachable body parts in order to hide his escape artist tools. This makes complete sense and is highly likely, but the prosthetics made by the team look horrible. By Houdini’s own accounts, he was searched thoroughly by the Russian police, so realism would have been of the utmost importance. That being said, the team of Houdini’s Last Secrets are not trying to fool anyone and are just trying to see if the escape is possible. Whether a fake thumb can pass for real is unimportant to them. What does come into question is whether Houdini would have been able to make a fake finger large enough to fit the tools needed for this particular escape. The stunt team makes two plaster molds and uses material such as seaweed. It seems unlikely that Houdini would have had the materials and time to make the realistic accessories needed for the escape. 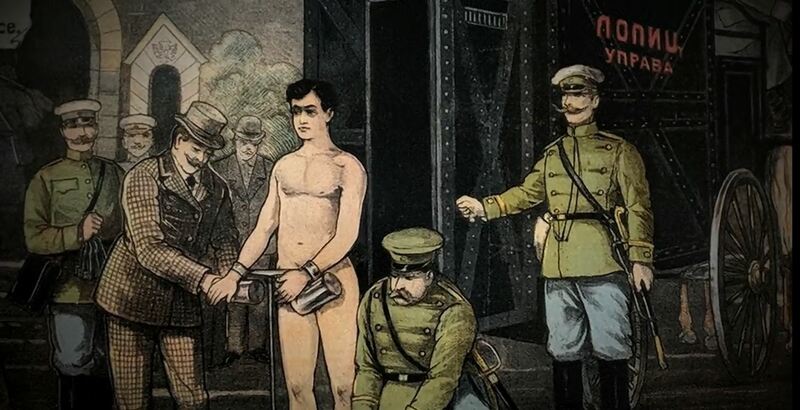 Unfortunately, episode three of Houdini’s Last Secrets does nothing to prove what it intended to. The research and ideas were sound, it just became clear that this was not something they were unable to accomplish. There are many moments in the episode that prove this. Most telling is magician Lee Terbosic’s attempt at completing the escape. Initially, the main goal is to find out whether the escape can be completed in the 28 minutes in which Houdini claimed to complete it. After some time, it becomes a question of whether the illusion can be completed at all. By the end of the episode, the audience is never told how long Terbosic was in the box. We are just told it can be done, thanks to “Gimmick X”. Again, this takes away from the science of the entire venture and essentially says Houdini had a magic tool. Despite these flaws, the episode is possibly the biggest success of the entire season. Another of Houdini’s many claims to fame was that he questioned everything and believed little without proof. One of the biggest groups he targeted were so called spiritualists and magicians. This episode is a great example of what Houdini would have called into question and therefore makes for interesting viewing.